Whisk 150ml whipping cream until it holds its shape. Add 3 tbsp unsweetened chestnut purée, 1 tbsp Irish cream liqueur and 1 tsp treacle and whip until smooth. 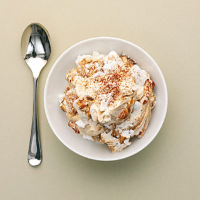 Top cream mixture with 6 meringue shells and lightly crush into cream with a fork. Lastly, dust with 1 tsp cocoa powder and divide the mixture into two bowls.